For other posts in this series on the book Life Together, click a number: 1, 2, 3, 5, 6, 7, 8, 9. In Life Together, Bonhoeffer emphasizes the importance to the church of the corporate use of spiritual disciplines. He begins by emphasizing the importance of praying the psalms together, noting New Testament exhortations for churches to "speak to yourselves in psalms" (Ephesians 5:19) and to "teach and admonish one another in psalms" (Colossians 3:16)" (see p44). Those who pray the psalms are joining in with the prayer of Jesus Christ....their intercessor.... The Psalter is the vicarious prayer of Christ for his Church. Now that Christ is with the Father, the new humanity of Christ, the Body of Christ on earth continues to pray his prayer to the end of time. This prayer belongs, not to the individual member, but to the whole Body of Christ. Only in the whole Christ does the whole Psalter become a reality, a whole which the individual can never fully comprehend and call his own. That is why the prayer of the psalms belongs in a particular way to the fellowship. Even if a verse or a psalm is not one's own prayer, it is nevertheless the prayer of another member of the fellowship; so it is quite certainly the prayer of the true Man Jesus Christ and his Body on earth (pp46-47). Whether together or individually, in praying the psalms, we learn to pray on the basis of Christ's vicarious prayer on behalf of his Body on earth. And so to pray the psalms is to pray with and according to the Word of God. In doing so, we appropriate the promises of that Word, which are prayers of faith--not merely faith in the things that might interest us at the time, or in the things that might address our particular needs at the time, but faith in the things that pertain to the whole Church. Jesus' own faith is being expressed in these prayers on behalf of the whole Church, his Body (see p47). But if the psalms are understood in this way as Christ's own words of faith on behalf of the Church, what are we to make of the imprecatory psalms? Bonhoeffer answers by noting that through these particular psalms, Jesus was taking upon himself God's wrath against his enemies. In doing to on behalf of his people, Jesus was acting to forgive our enemies. These are powerful and profound words on the lips of Jesus, for he, in his own mind and body, suffered the wrath of God against evil in order that his enemies and ours might go free. As we pray these psalms together with Jesus, as members of his Body, we share in Jesus' own heart of forgiveness and grace for our enemies and the enemies of all of the people of God through all time (see p47). As noted above, the psalms are particularly powerful as we pray them together as the Body of Christ. Doing so reminds us that our individual prayers are but a tiny fragment of the whole prayer of the Church. When we recite psalms together, we are lifted above our narrow, personal concerns and allowed to pray selflessly (p49). "But," some might ask, "would not such recitation together, on an ongoing basis, constitute 'vain repetition?'" Bonhoeffer's answer is "no"--particularly as we remember that "in all our praying there remains only the prayer of Jesus...The more deeply we [together] grow into the psalms and the more often we pray them as our own, the more simple and rich will our prayer become" (p50). We should note here that the psalms are written primarily as songs to be sung by the people of God together. Many are written with lines that were sung (or spoken/chanted) by the "song leader" with lines that follow to be sung responsively by the congregation. Bonhoeffer, being Lutheran, was accustomed to such responsive group readings of the psalms as part of the standard liturgy. But when the Confessing (dissenting) wing of the German Lutheran Church was forced underground by the Nazis in the lead-up to World War II, Bonhoeffer found even deeper meaning and efficacy in reciting the psalms together as part of worship in the small underground house churches that formed in that breakaway movement. 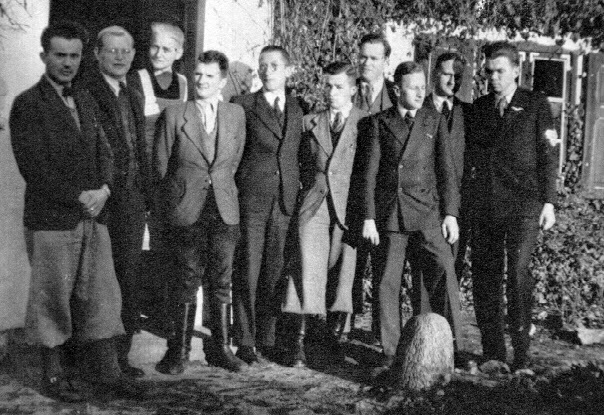 Bonhoeffer (second from left) and others in the Confessing Church movement.